In the 18th century, concert-going was a social affair. People would walk in and out of concert halls whenever they wanted, there might have been dogs running around, and audience chatting or playing bridge between and during pieces. Then in the 19th century, a hush fell upon the concert hall – composers were increasingly seen as artists, an idol to be respected. They presented more musically challenging works to listen to, works for posterity that were emotionally draining to listen to, yet uplifting and inspiring. Thus the music and socialising got taken to the fashionable cafes or drawing rooms instead, where, at salons or soirées, instrumental music of a light, pleasing, and often sentimental character was played in an informal setting. Violinist Jun Hong Loh and pianist Abigail Sin were inspired by successful concert presenters such as Young Concert Artists in New York, Chamber Music Society of Lincoln Center, as well as festivals such as the Verbier Festival in Switzerland. The YCA, an artist management firm, attracted the best musicians under 30 from around the world. Every concert was branded by each individual star’s excellence and personality. For them, it was always wonderfully exciting to see the best talents gather together to perform in YCA events. The Chamber Music Society of Lincoln Center had a roster of established musicians who would be called on to give concerts together but not just as soloists; in a single concert, they would get to see duos, solos, trios and even quartets, all combined into one event. Thus, they decided to bring back the Salon-style setting in organising this concert series More than Music, which focuses on the entire audience experience, in an informal setting. 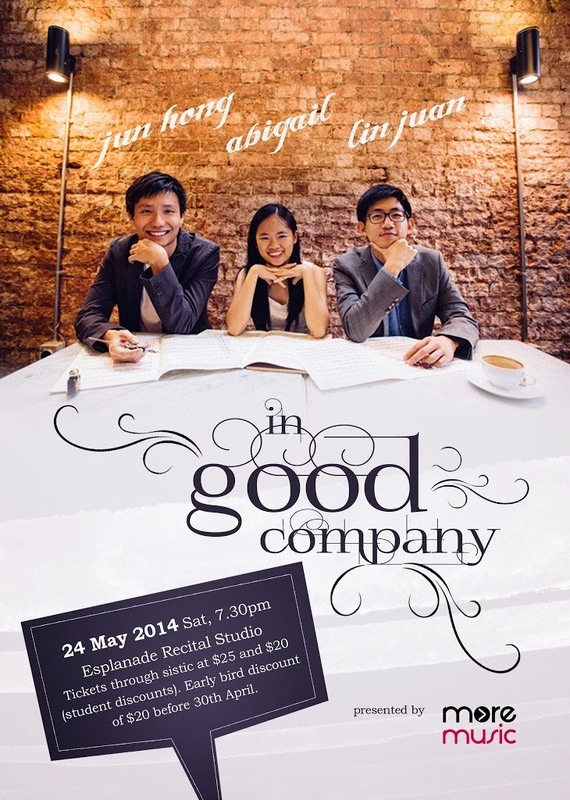 In this coming concert ‘In Good Company’, cellist Lin Juan joins them for a programme of duos and trios. 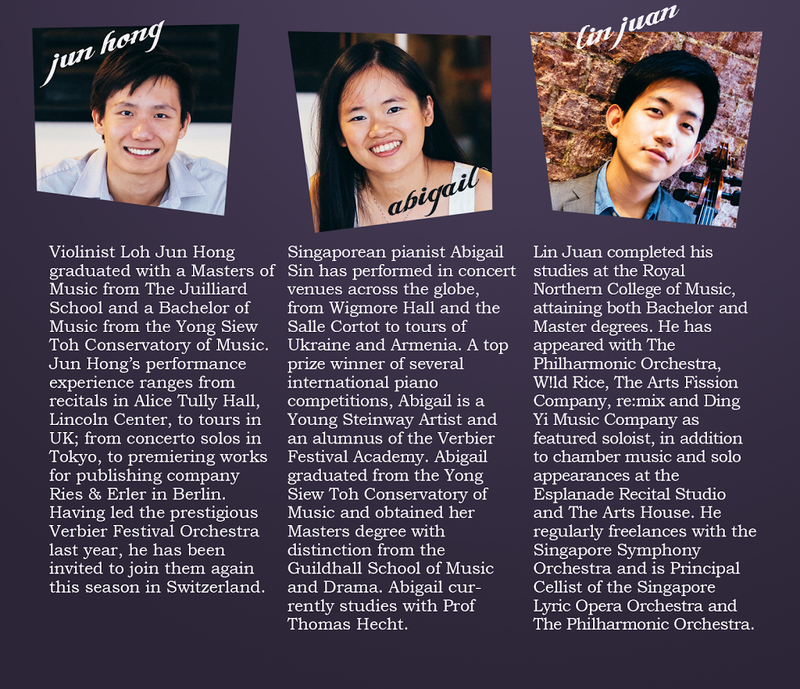 Join Jun Hong, Abigail and Lin Juan at the Esplanade Recital Studio on the 24th of May 2014, and relive the golden age of salon music with popular music played in the style that was the height of fashion in the grand European cafés of the early twentieth century! Get your tickets from Sistic now!